Good morning All....Today's challenge at Pals Paper Arts is Snowflakes. My inspiration came from an email chat with Jan, an internet friend. We both like white on white. Today is sunny in California, but snow is still in our winter future. For this challenge I used, ribbon from my stash, white 110 pound card stock, and Cuttlebug snowflake embossing folder. 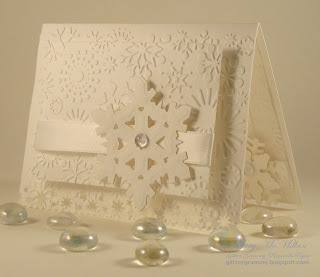 I then added cuts from my Spellbinder Build A Snowflake die and topped the snowflake with a clear Dew Drop. This is a quick and easy card. I LOVE white on white. Off to Weight Watchers I go, followed by fun with Carolyn and tonight....a class at Paradise Scrapbook Boutique. It will be fun seeing what Karen came up with for this class and to find out all about CHA. Beautiful White on White! Love all the details. Wow this one took my breath away!Gorg-uss! What a beautiful white card! Stunning! I love the white on white! So elegant and classy! Thanks for playing @ PPA! This white on white is lovely - lots of pretty details - thanks for joining us @PPA! Your card looks very stunning. Amazing which effect the white on white has! So simple and so great! This monochromatic scheme is gorgeous!